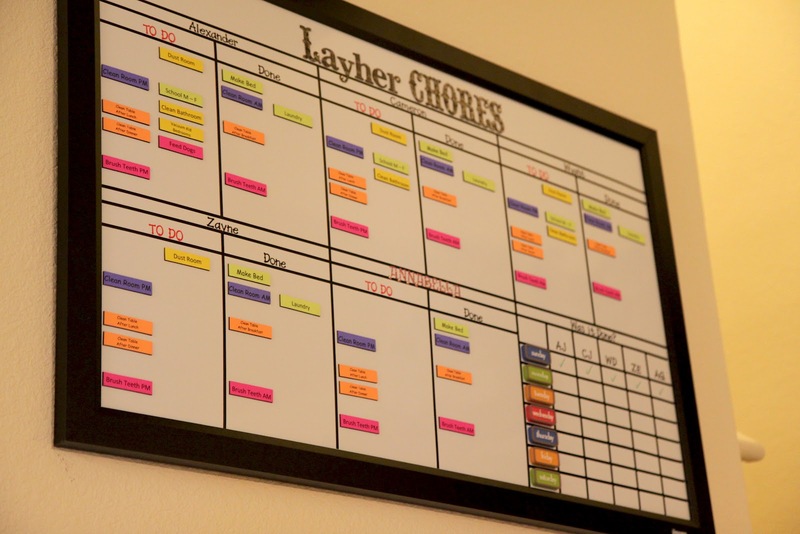 Organized Chaos: Multi-Child Magnetic and Dry Erase Chore Chart! I ventured out yesterday to the craft store with grand plans of adorable chore charts I'd make each child. When I started pricing what I was going to need, those plans quickly changed. So, while standing in the middle of AC. Moore, I came up with a new idea on the fly and I'm pleasantly surprised at how well it actually turned out, especially for not being all that well thought out. Here is my new Multi-Child Chore Chart! I'll tell you how I made it, below. I decided I would do 6 separate sections. 5 for the first 5 kids (since Declan is just a baby) and the 6th for a section to keep track of whether they completed their tasks each day or not. Each day they will either get a green check, showing they did everything or a red X showing they didn't finish everything. At the end of the week, those with green checks every day, will get a small treat or reward. 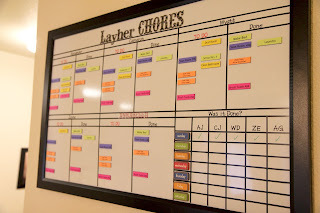 I decided to do the chores pretty detailed, like "Clean Room AM", "Clean Room PM", "Clean Table After Breakfast", "Clean Table After Lunch" etc. This was really easy to make. It was a little time consuming (about 2 hours) because I am just a tiny bit of a perfectionist (and by tiny bit, I mean I am obsessive). I took the large magnetic dry-erase board and decided how I wanted to divide it up to make the separate charts. I used the rulers and measuring tape to figure out where the lines needed to be made to evenly divide the parts of the chart. When all of the lines were done, I used the scrapbook letters to add all of the names and text to the board. Finally, the second most tedious part (second to applying all of the lines) was making the magnetic chores. I cut the magnet tape into 2-inch sections and printed the chores out onto the brightly colored paper. 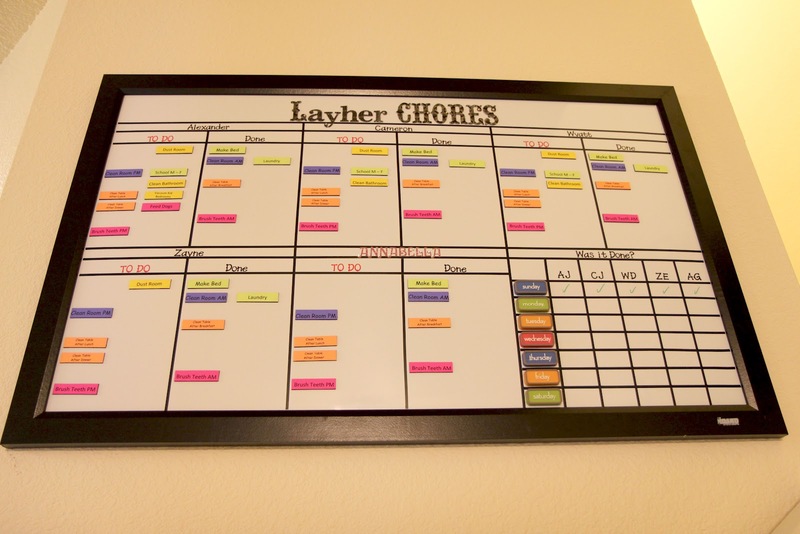 Once the chores were printed out, I cut them out, larger than the magnets, peeled the paper from the magnets to expose the glue and stuck the chores on. Then I trimmed the extra paper tightly around the magnet to finish them. It's completely ready to go, from there! This idea is so basic, it can EASILY be adjusted and varied to fit your needs. The best part about this is, EVERYTHING on it is removable, so I can change it later! Such a great idea! I love how it turned out! That is neat. 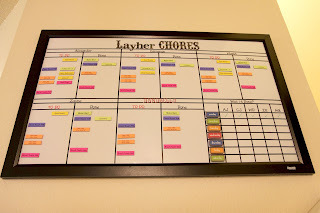 I've been googling magnetic dry erase chore charts this morning trying to find something that will work for our family. We used one I had made and laminated before when they were really little, then I tried the Melissa and Doug one. They are 2, 5, 6 so I'm looking for something I can really customize. I hadn't thought of visiting a craft store for a board!! 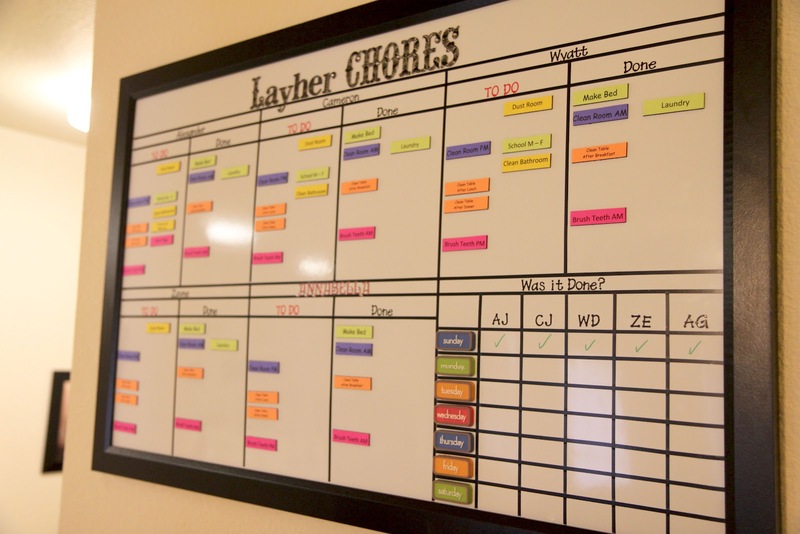 Do you have a list of the chores you put on the board. I am a little overwhelmed on trying to decide what my kids can do and what I need to still do. Also, how much more work it will be for me to "teach" them how to do some chores. Also, I noticed you did a lot of colors. Was there any type of color coding that you did? What a great idea! I have been looking for something like this for a while. All the charts that I found were not as detailed and had to be modified, which honestly was a pain since I could never get the chart completed as wanted. Thank you so much for sharing. I mostly color coordinated by morning chores, afternoon chores and evening chores. I went into details like picking up after meals, brushing teeth, picking up rooms etc. 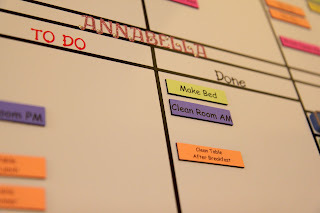 Things you really want to encourage them to help with around the house :). What size board did you use? I'm trying to figure out what size board would be good for 7 kids.